Draw a pie divided into as many sections as you'd like. Choose one with ten sections. Cut out the circle and glue that circle onto a cardboard circle of the same size for added thickness and durability. 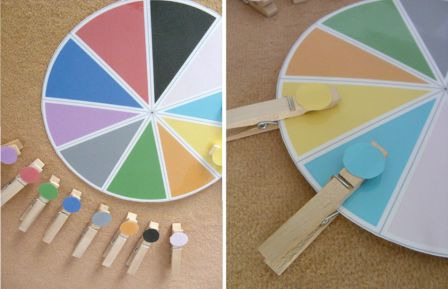 Then use colour images to make each section of the pie represent a different colour. Glue image those same colours on the clothespins and you're ready. The children pin the corresponding clothespin onto that section.